Chevron Gift Cards can be redeemed at any of the more than 8,000 Chevron or Texaco stations in the United States for fuel, snacks, and services. There are no maintenance or hidden fees associated with the gift card and the card will never expire. Use of this card constitutes acceptance of the following terms: The gift card is redeemable only for fuel and authorized goods and services at participating Chevron and Texaco stations. For a participating location, visit www.chevrontexacostations.com. This gift card is not redeemable for cash or credit, except where required by law. This gift card is not a credit card, debit card, asset account or a deposit account. 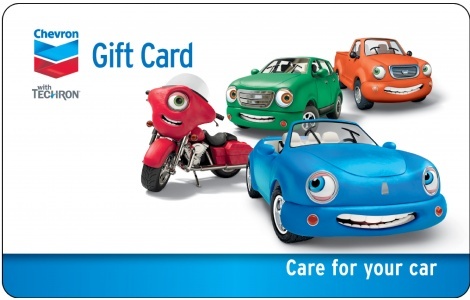 To check the card’s remaining balance or to report a damaged card, call 1-800-352-1090 or visit www.chevrontexacogiftcard.com. Remaining value may be replaced on a lost, stolen or damaged card only if the account number and remaining value on the gift card can be verified. This card is issued and administered by SVM, LP. Cards provided for promotional purposes may contain an expiration date, if allowed by law. If no date is shown, then the gift card will not expire. This card is not subject to maintenance fees. Redeemable in the United States only.